Lacquer Lockdown: Press Release: Sneak Peek at Bundle Monster's Polynesia Nail Art Stamping Plates! 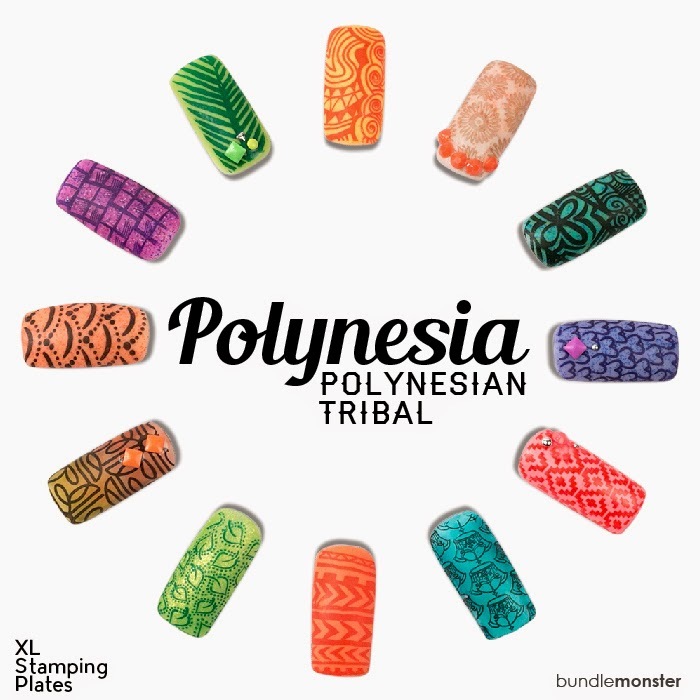 Press Release: Sneak Peek at Bundle Monster's Polynesia Nail Art Stamping Plates! You have no idea how EXCITED I am to share this post with you. I am always always a fan of stamping, no duh right? But when a collection comes along that resonates with something I love I get way way way too excited and way way way too freaking happy! I'm bouncing on my toes right now I swear. Bundle Monster has created a new collection of plates themed around the Polynesia culture! This makes a perfect and absolute sense to me. Its a brand that originates from Hawaii an island culture rich with Polynesian heritage. I AM SO EXCITED - its going to be tribals for days! And you know how I feel about tribals!!! Right now all I have are mockups to share with you guys and some press information which is definitely a teaser but I still had to share anyway :) The best part of this latest collection is that they will be made from the XL stamping plates - hallelujah!!!! Ladies you just don't know the church hymnals that are erupting in my head right now lololol! I'm ready to go tell it on the mountain, over the seas, to the cashier at my grocery store, everywhere!!! 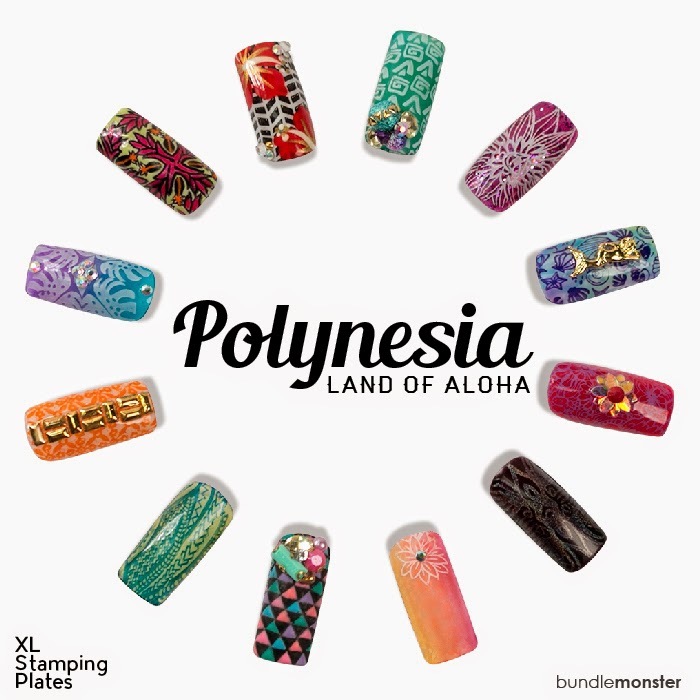 HONOLULU -- Summer’s almost here and Bundle Monster wants you to escape to their island home with their newest Nail Stamping Plate Collection,Polynesia. The feeling of the lush, tropical islands will be wrapped around your pretty fingers with this extra large (XL) nail plate collection, featuring 20 tropically cultural plates. The entire collection comes with 4 themed sets of 5 rectangular XL nail plates. Each set pays homage to the different island cultures of Polynesia. Explore these ancient worlds through Samoan, Māori, Fijian, Tongan and Tahitian designs, with a special shout out to local Hawaiian culture -- where Bundle Monster was born! Each plate will have a vibrant mix of single nail images and a buffet-style layout, so you can create your own style. Aside from the fierce tribal, deliciously lush tropical and simply beautiful fauna and flora, you’ll learn a few island words to rock on your next mani -- now dat’s da kine. Dive into Hawaii’s funky island culture, from pau hanas to palm trees to colorful shave ice! Wrap your nails in traditional Hawaiian textile prints while visiting some of Waikiki's most iconic landmarks. Welcome to a world of island culture that will bring you back to old Polynesia. Pay homage to the tribal designs respected by Polynesian cultures Pacific-wide. Bundle Monster’s Polynesian nail stamping plate collection will be released on Thursday, May 14, 2015 for $19.99 for each set (5 plates per set) or as an individual plate for $4.99 each. Wow! These stamps look awesome!